You may remember that a couple weeks ago, my colleague Chris Lindley launched his new Endorphin gym on South Broadway and offered a free yoga class in celebration. It was super fun, the studio was great, and the place was packed! 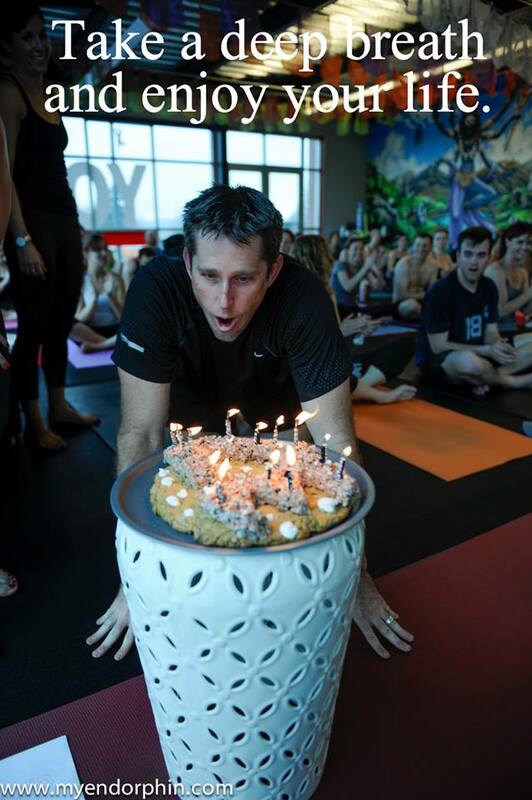 It also happened to be the week of Chris’ birthday–see above for his post-class birthday treat…. This week, Chris wrapped up a total remodel of his Endorphin yoga studio at City Park, and is offering free yoga all day on Saturday and Sunday in celebration. Whether you’re a beginner or a pro, the studio is offering a little something for everyone: Saturday’s classes are Detox Flow, Kinesis, Asana and Beyond-Women’s Practice, and Strength and Flow Yoga; Sunday’s options are Yoga Foundations, Kinesis, Yoga Scult, and Community Yoga. ALL of the yoga classes this Saturday and Sunday are free, and if they are anything like the SoBo opening, they all should be awesome! Endorphin City Park is located at 3170 E. Colfax Ave (at the intersection of Colfax and Steele). See you there this weekend! Endorphin has been motivating warriors throughout Denver and Englewood with yoga, indoor cycling, boxing and functional fitness. Previously known as “Qi,” Endorphin officially re-branded in 2014 with the tagline “movement is our drug.” Endorphin operates four locations throughout the greater Denver area, including two on Colfax (Ryder’s and City Park), one in Lowry, and a new yoga studio on South Broadway. An additional location at Broadway and 11th is coming soon. For class schedules, instructor profiles, and more, visit www.MyEndorphin.com. Interested in living near Endorphin, City Park, and Congress Park? Click here to search Denver City Park and Congress Park homes and condos for sale.